In the UAH lower troposphere data, each of the last four months has been the hottest ever for that month. 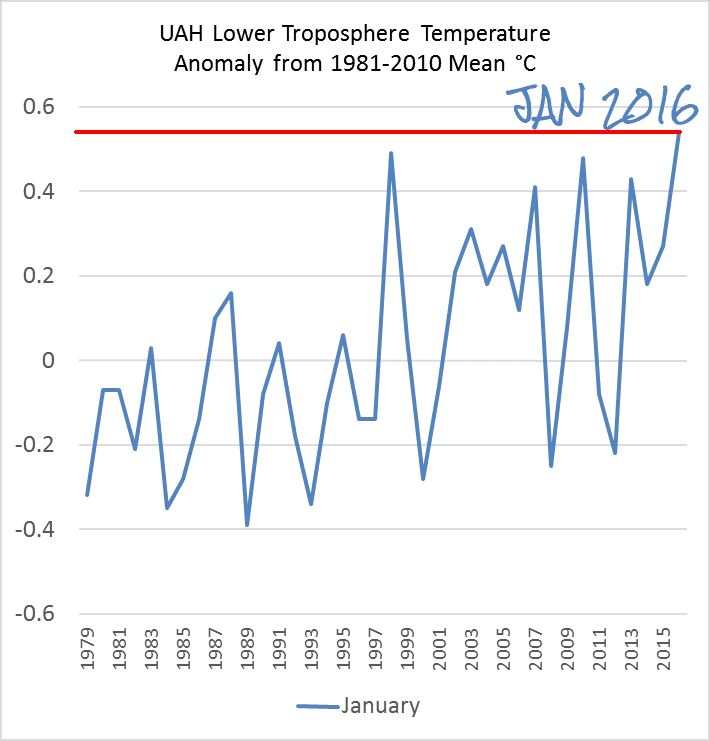 Here is the chart comparing January only. This has beta v6.05 for January 2016 and 6.04 for the rest. 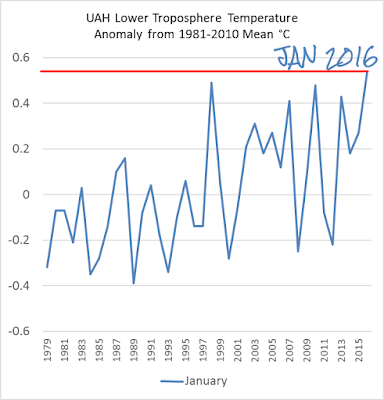 If this keeps up then 2016 could be a new record high for the lower troposphere - or not. It's only January after all, so it's a bit soon to speculate. 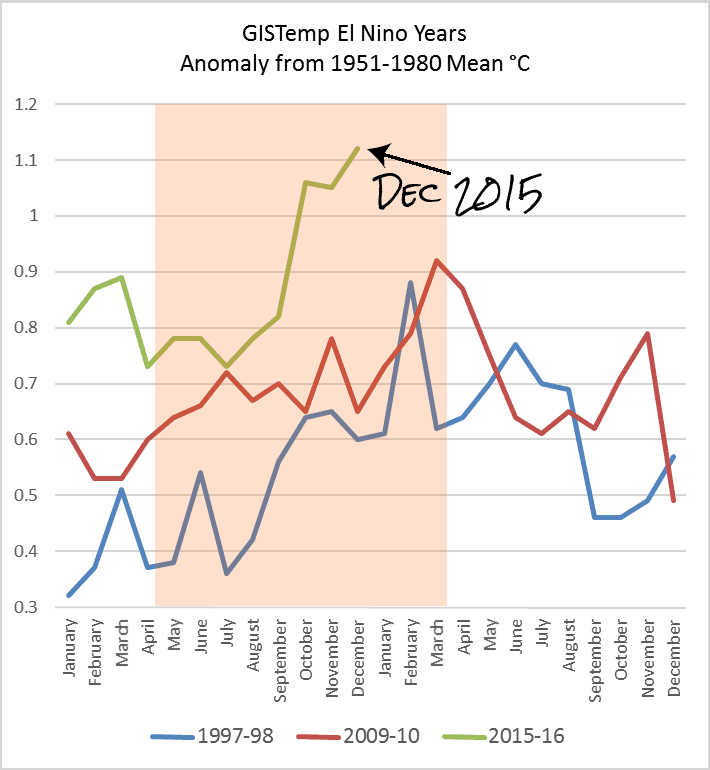 While here, I might as well show you the El Niño chart for the surface, with GISTemp, including December data. The surface has heated up a lot more than the air above it. 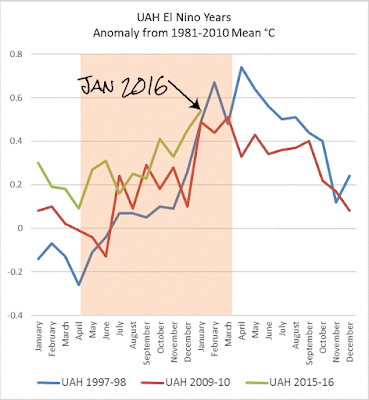 The NOAA data shows the NINO 3.4 region index at 2.3C which is the same as 1997/98. I think this January figure completely removes the pause from the UAH beta record (assuming there's no big surprise in version 5). That is, of course, if you use Christopher Monckton's ridiculous definition of the pause as the furthest back you can go and get a non-positive trend line. As I understand it there'll always be a Monckton Pause of some length because the uncertainty of short periods (few data-points) is so great. The problem Chris Monckton has is that his Pauses are starting ever later and getting ever shorter. Seventeen years is commonly regarded as the absolute minimum period for finding a trend of the expected magnitude given the natural variation. I find it interesting that even a cherry-picked period crossing a PDO transition from warm to cool phase couldn't produce a Monckton Pause longer than eighteen and a half. When I check for the Monckton Pause I exclude anything less than 5 years, but I don't think you correct to say there will always be some pause. 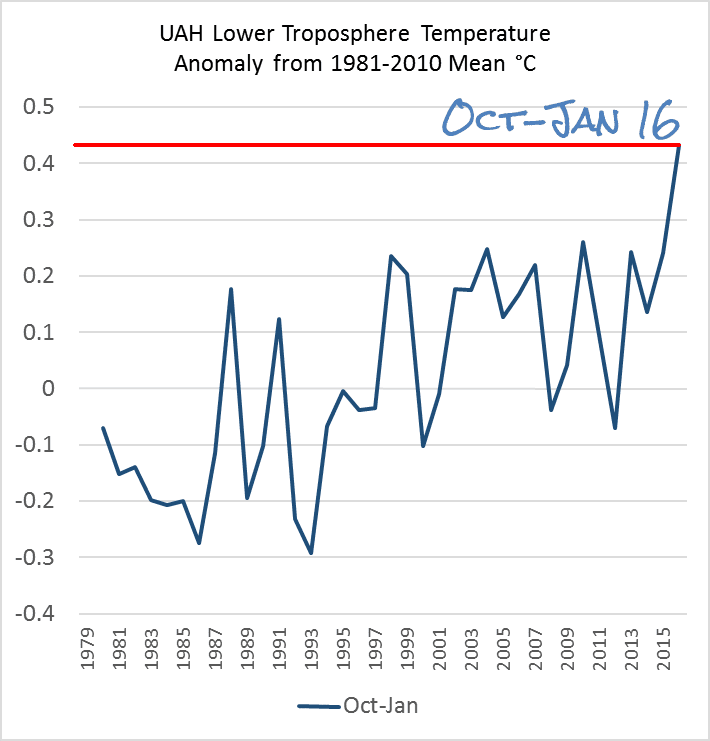 Over the last 5 years trends increase exponentially as we approach the current high point - over 30 C a century measured over the last year. That said I was only using the old UAH data with the current month added, when the new version comes out we may well see a month or two that still have a slight negative trend. In any event, Monckton only uses RSS data, and that's only moved the start of the pause forward a month. In "some Monckton Pause" I include six months. I agree though that not every new Monckton Pause will be shorter for the next couple of years - perhaps one in every two or three. Ed Hawkins has a post about this over at Climate Lab Book. 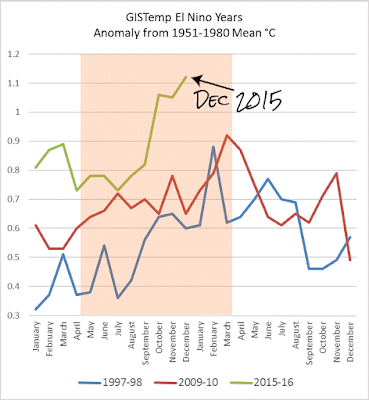 Many people have compared 2015 to the El Nino year of 1998, which still has the record in the satellite series. But from an ENSO perspective, 2015 should be compared to 1997 (as in Sou's graphs above). 2016 should be compared to 1998. I think there is a fairly big chance that 2016 will beat 1998. By the way, when the data comes on line I'll compare the different versions of the perfect data set that is beyond reproach. The new one is the fifth try - and that's just with version 6.0 beta. There were obviously five other perfect versions, some with sub-perfect versions. E.g. Version 5 went up to 5.6. Sou, I don't know if you've noticed, but version 5 is finally online. 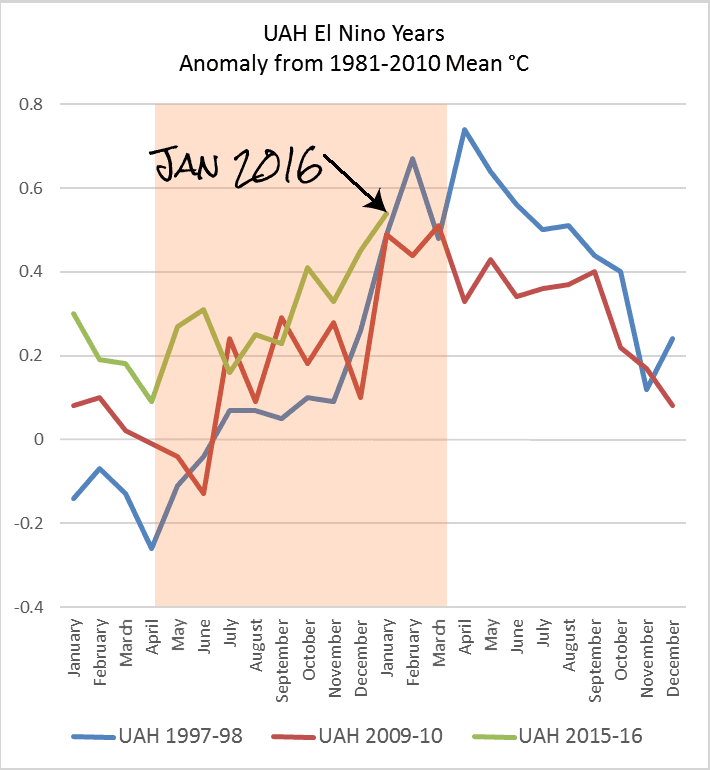 It has easily exceeded the 2010 El Nino value. "In addition to a major El Niño Pacific Ocean warming event, 2016 has 17 years of warming to raise the base temperature from which the El Niño begins." So no 18 year pause?